As I write, I am in my pyjamas and dressing gown. 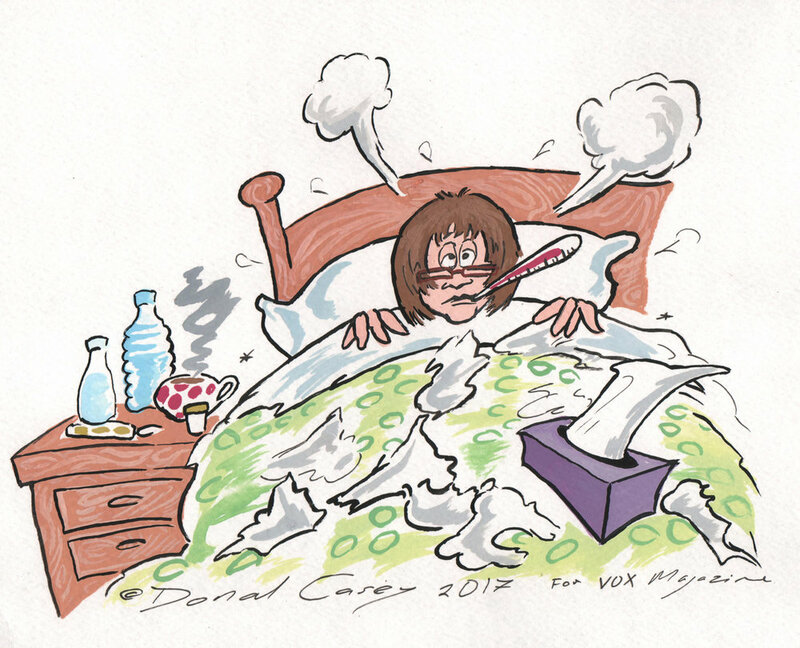 Surrounded by tissues, medicines, inhalers and an array of liquid refreshments, I am at the, “tell my family I love them” stage of a head cold. I get a cold at least three times a year; and not just a sniffle. My colds are the real deal. Sneezing like it’s an Olympic sport, coughing that sounds like I smoke 60 Woodbines a day, and to top it off, a voice that sounds like Ronnie Drew; with a cold! Man-flu regularly comes to this house – but it is I, and not the man of the house, who catches it. I think himself has been ill about three times since we met. You know the way some people are not good patients? Folk who don’t like being waited on and hate having meals and medicines administered to them? Well, that’s not me. I’m a GREAT patient. You can pat my head, heat me some soup, look at me like I’m a wounded puppy and plump my pillows. I will respond with a grateful whimper, the weakest of smiles and a heavy sigh. At the moment, I don’t feel wonderfully made. I’m aching all over. My throat is sore. My nose is sore. Even my hair hurts! These symptoms though, are actually for my good. (Ok so I’m not sure about the hair thing…) They tell me, there is something wrong, and that I, or someone in a less weakened state than I, need to do something about it. Our bodies are made in such a way that when our temperature goes up, we know about it. If that went unchecked, it could be potentially dangerous. But, we take medicine to bring it back down. Do you know our noses run for a reason? The inside of our noses work over time when we have a cold, to wash away germs and so protect us from infection. As uncomfortable as coughing can be, it’s a reflex of the body to keep our lungs clear, so we can breathe. I’m no medical expert and I confess these are very simplistic and general explanations of how our bodies deal with sickness. Even in the sorry state I’m in, I can see evidence that I am fearfully and wonderfully made. And though praising God for my cold might not be easy, I can praise His creative wonder. I must sign off now. I need to preserve my strength. I have to reach past the throat lozenges for another tissue and they are right at the other end of the sofa!